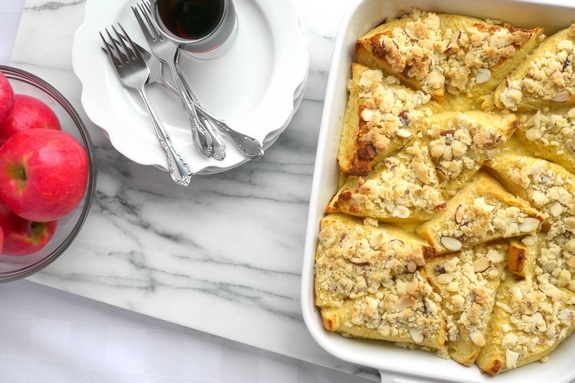 I can’t think of a better way to wake up than with this Streuseled Overnight French Toast. You will appreciate how easy such a wonderful tasting breakfast is to put together. Enjoy it for Sunday brunch or a holiday meal. If there are any leftovers, they taste great too. If you’re like me, you love French toast. It was always a weekend breakfast dish when I was growing up, but now I love making it for dinner on a weeknight. Don’t forget the side of bacon! How often do you serve Breakfast for Dinner? It’s a great party theme too. 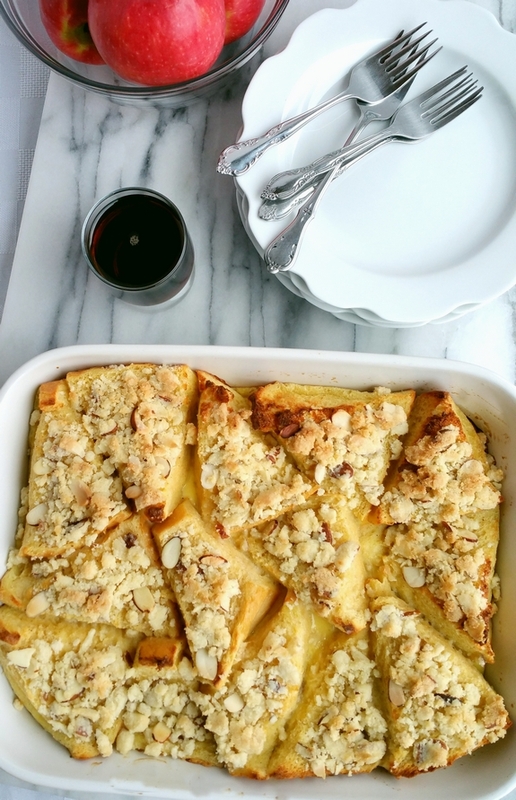 Many would call this Streuseled Overnight French Toast a “casserole” or a “French toast casserole”. And I agree 100 percent with that distinction. 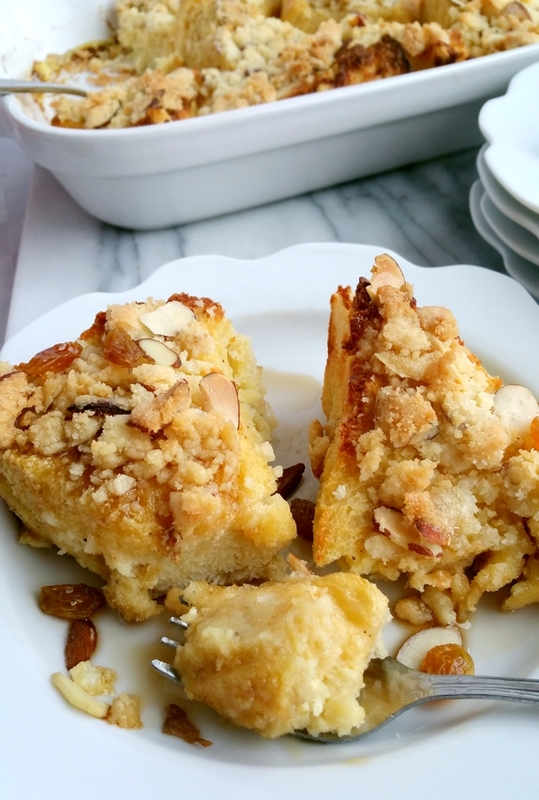 It’s reminiscent of my Overnight Pannetone-Eggnog French Toast, which is the perfect way to use up all those gifted holiday pannetones. Having breakfast ideas that are perfect for a holiday or brunch crowd makes entertaining so much easier. These Perfect Brunch Eggs are the answer to serving eggs to a big group and make this Bacon, Tomato and Cheddar Breakfast Casserole with Eggs if your friends and family love a savory, breakfast meal. If you’re looking for the perfect stoneware bakers for your French toast creation, I am currently obsessed with these and these. The presentation for both will be beautiful. I like to slice my French bread on the diagonal, I think it looks nicer and makes for the perfect serving size. 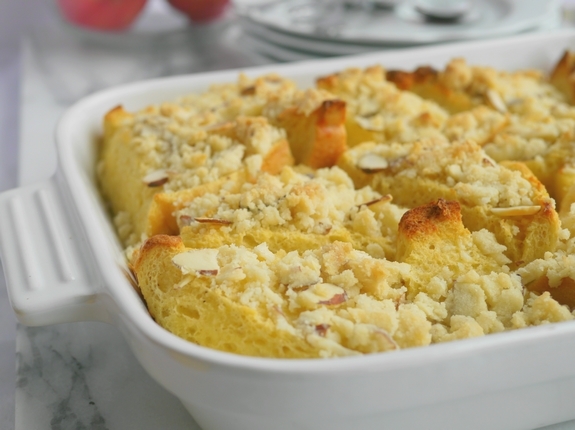 This dish is gorgeous right when it comes out of the oven. The ends of the bread are crisply (is that a word) browned, while the rest of the bread remains very bread pudding like. It’s so good! Seriously this is going to be the best thing on your buffet table. The leftovers are just as amazing, so don’t worry about finishing it all in one sitting if there are only two of you. Just pop it in the microwave the next morning and enjoy. I hope you love this as much as we do. It’s absolutely company worthy…just in case you’re wondering. Who doesn’t love brunch? And there are so many fun things to eat for that special mid-morning meal. This Bundt Pan Bacon Egg and Cheese Brunch Bread is one of my favorite ways to ring in Sunday morning. Every weekend breakfast needs a Champagne Brunch Punch. This Smoked Salmon Brunch Taco Bar is a unique and delicious way to celebrate the weekend. This Beautiful Breakfast Tart is also gorgeous for a morning meal. Spray a 13 x 9 pan with nonstick spray. For the French toast, combine eggs, milk, half-and-half, sugar, vanilla and nutmeg by whisking together in a large bowl. 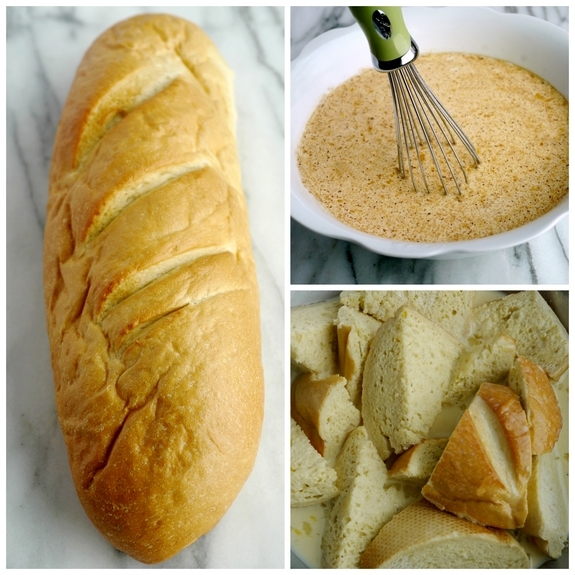 Slice the ends off your loaf of bread and then slice your bread lengthwise. Slice each half into equal diagonal pieces. Place slices into egg mixture, letting them absorb some of the custard, about 10 minutes. Arrange the dipped bread pieces in the baking pan, crust side down. Pour all leftover custard over the bread. Cover the pan and place in the refrigerator overnight. 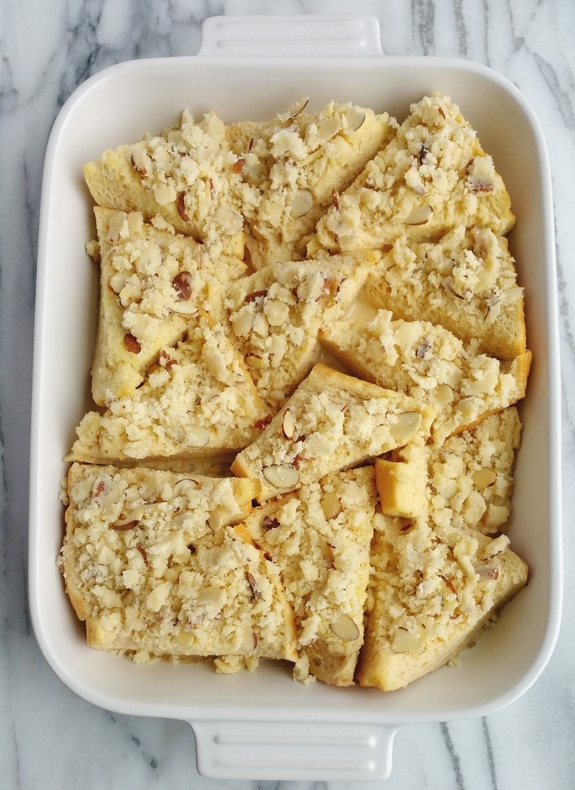 Combine all ingredients for the streusel in a bowl and sprinkle evenly over bread slices. 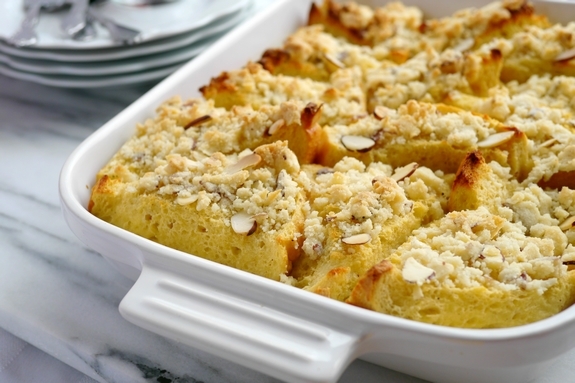 Bake until the streusel is golden brown and the bread is set, about 30-35 minutes. Amazing recipe, I make it all the time when I have sleep over guests they absolutely love ❤️ it. 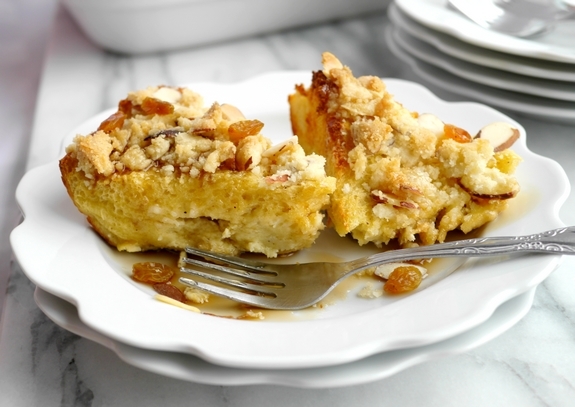 Only change is I double streusel topping makes for more decadence. Oh wow, I get you!